Today is my birthday.. it's another big one.. wow.. I do not feel my age so I guess that is good. Today Monika at Creative with Monika and I are doing our challenge for each other again.. this was my turn to chose so I said number background, one flower and leaf or leaves and birthday.. So this is my card. I took black card stock and Paper Trey Ink numbers die and cut numbers I did it about 4 times so I would have a variety of them. Then I laid them out and once I had what I liked I adhered them down.. next time I think I would run through my Xyron.. I don't like the residue from the glue. I then used Birch press flower and leaves and Altnew inks. For some reason the dark green in the leaf is not showing up.. I guess I should of used a darker green. I used a Simon Says sentiment and Nuvo drops. I am happy with the look.. I can even see my age in there.. LOL.. of course the numbers aren't together but they are there. 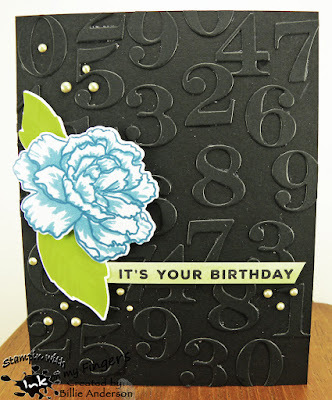 Head over to Monika's blog Creative with Monika and see her card..
Love the texture and the pop of blue from the bloom. we choose the same 2 leaves one flower yayyy.. I just on line and added the photo of my card and I am done with my Post yaay..
A very creative card. Thank you for joining us at QKR Stampede this week. Beautiful card. Thanks for playing our challenge at CCC Digi Creations. Good luck! Thank you soo much for taking part in our "anything goes with optional thanks” challenge over at Creatalicious & good luck in the draw.